Several different home remedies have been suggested over the years for onychomycosis and other nail fungus treatment. Clinical trials have not been run on any of these home remedies; however there is anecdotal evidence that many of them do work. Sometimes it depends on the individual, or the kind of nail fungus they have, as to which remedies work and which don’t. Another factor is the ability of the remedy to get under the nail sheath and reach the infected area, which is usually underneath and in the nail bed itself. In favor of the home remedy, there is usually little to no risk of making anything worse than it already is, and these are usually inexpensive to try. If the nail bed and lunula are affected, topical and over the counter medicines will not be effective, which also eliminates most home remedies. In these cases the only cure is an oral medication which requires a prescription from a doctor. 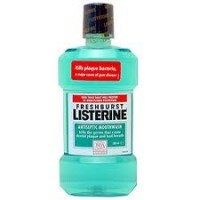 Listerine, a mouthwash that advertises the destruction of bacteria that cause gum disease is a very popular and inexpensive treatment for finger or toenail fungus. After all, if it destroys one kind of bacteria, why shouldn’t it be effective for getting rid of other kinds of bacteria? Ingredients in Listerine are ethanol, thymol, eucalyptol (from eucalyptus), and benzoic acid. Standard treatment for onychomycosis using Listerine is to soak the affected area in Listerine for 10 minutes every night until the affected area clears. Onychomycosis is caused by a few different factors. Infection from Candida is one of them, so if the Listerine can penetrate to the site of the infection, it is possible, even probable that this will be an effective treatment as Listerine has been shown to be effective against Candida. Another cause of onychomycosis is dermatophyte, which have not been demonstrated to be as negatively affected by Listerine’s chemical make-up. As the majority of onychomycosis are caused by dermatophyte, Listerine may not be effective in all cases of nail fungus as a home remedy. 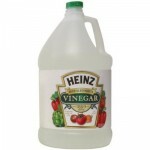 Vinegar, with its acidic environment helps to destroy the dermatophyte that cause onychomycosis. Also known as acetic acid, this remedy is made up of one part vinegar and two parts water. By soaking the affected area for 20 minutes per day, the acetic acid is able to create a less habitable climate for the fungus, thus discouraging its continued growth. Continue treatment until the affected area clears up. It is also possible that the skin around your nail will become irritated. If this is the case, treatment should be discontinued. There has been no significant difference discovered in using apple cider vinegar vs. white vinegar nor over-the-counter remedies that contain acetic acid (vinegar) vs. using the vinegar and water mixture described above. Because of the inherent make up of Vicks VapoRub, it does a better job of penetrating the nail to get to the source of the infection. This is a commonly recommended home remedy from physicians as they have seen improvements in patients who use this product. The petroleum jelly based mixture, infused with oils, such as menthol, allow for better infusion of the infected area. Topical application is the only appropriate way to use Vicks VapoRub (after all, would you want to eat that stuff?) The “dose” is up to the applicant. The most common method of cure is to apply the substance to the affected nails and wear a sock or glove over the treatment. To prevent a re-occurrence of infection somewhere else, as fungus loves a moist environment, make certain to use a sock or glove that is 100% cotton for breath-ability. Tea Tree Oil, or Melaleuca Alternifolia has been found to be an effective natural anti-fungal. When applied in vitro (meaning poured into a dish, thus soaking like many of the other listed methods) Tea Tree Oil was found to discourage fungus growth in all of the common causes of onychomycosis, including Trichophyton mentagrophytes, Trichophyton rubrum, and Candida infections. Tea Tree Oil has been used in clinical trials and one of them reported a 20% cure rate while the other reported a 0% cure rate. The determining factor seems to be using 100% Tea Tree Oil instead of a diluted solution. The appearance of the nail fungus seemed to improve in people who used the 100% solution. Tea Tree Oil is recommended as a topical solution for many skin fungus conditions and has been seen to be effective in treating tinea pedis, a minor foot fungus. This is probably because the Tea Tree Oil is able to penetrate the infected area, thus reaching and eradicating the fungus. Camellia Sinensis or Green Tea Extract is another herbal remedy that has shown antifungal properties. When applied in vitro (in a dish) Green Tea Extract proved able to kill Candida glabrata. No one has done clinical trials with this herbal remedy so its effect on dermatophyte, and therefore onychomycosis is currently unknown.